Photography can be considered a subjective recording medium through which to communicate and express your individual ideas. The choice of subject and how you arrange it within the frame have enormous effect on this communication. The process can be further enhanced by varying the way you use the camera and its controls when capturing images. Consider the camera just as a tool to communicate your vision. When you are framing an image, your lens is focused on the subject which is of primary interest to you as a photographer. Since the viewer of the image will be instinctively drawn to the area of the image which is most sharp, you influence the viewer to share the same point of view. Your images can be sharp or unsharp in different ways. One way is with regard to capturing motion. Another kind of sharpness concerns depth of field, how much of the scene wil be sharp in the image. You need to use a fast shutter speed if you want a moving subject to appear sharp in a photograph. Otherwise, if the subject moves while the shutter is open, it will appear blurred. To capture fast action a lot quicker, point the camera toward where the action will occur and press the shutter button half way to set focus and exposure. Hold the button down until the action happens. The question you might ask is how fast is fast enough ? Speed of the subject - the faster a subject is moving, the faster the shutter speed you need to produce a sharp image. Direction of the subject movement - when a subject moves parallel to the image sensor while the shutter is opened, it will cross more of the pixels on the sensor and be more blurred as compared to a subject moving directly toward or away from the camera. So if a subject is moving toward or away from you, you can use a slower shutter speed to create a sharp photograph, as compared to when a subject is moving from one side of the scene to the other at the same speed. Distance to the subject and focal length of the lens - the closer is a subject to the camera, even the slightest movement it makes is enough for it to appear blurred in the photograph. The further away the subject is from the camera, it can move considerably before its image on the sensor moves very much. Select a fast shutter speed such as 1/500. For photographing moving subject or attempting to convey motion in your images, select shutter priority mode because it gives you direct control over the shutter speed. In addition to choosing the focal point in an image, you can also control how much of it is perceived as being in focus. As we have mentioned before, this tool can be key in directing the viewers attention to what is important in an image and thus communicate your ideas more effectively. For example, controlling for depth of field you can single out one person in a crowd or the entire crowd can appear in focus depending on your point of view. Aperture size - the smaller the aperture you have selected, the greater the depth of field and vice versa. Distance to subject - the further away you move from the subject you have focused, the greater will be the depth of field in the image. As you move closer to the subject, you decrease the depth of field. Focal length of the lens - using a long lens or zooming in, decreases depth of field. While using a wide-angle lens or zooming out, you increase it. In practice all of the above three factors affecting depth of field are working simultaneously. Aperture remains your main control over depth of field as framing dictates the lens and the distance to subject. For maximum control over the depth of field, it is best that you select the aperture priority or manual mode on your camera. Secondly, decide whether to draw attention to this subject; isolate the subject entirely or integrate it with its surroundings. When photographing landscapes, you want maximum depth of field, with entire scene sharp from near to far, you need a small aperture and short focal length lens. When photographing portraits, you want shallow depth of field to isolate the subject from a distracting foreground or background, you need a wider aperture setting and long focal length lens. To ensure overall focus in the image, instead of focusing on infinity, focus approximately one third of the way between you and the horizon. This will increase the depth of field in the foreground of your image. You can use this technique not just for landscapes, but whenever you want to shift depth of field toward and away from the camera. Zoom in or use a long lens to enlarge the subject. To get a practical experience with the creative camera controls follow our Photo Assignment to make flowing water turn to silk. The automatic exposure mode on your camera is a very useful feature as in average brightness conditions it will produce correctly exposed images while allowing you to concentrate purely on the image. You will find this mode especially useful in rush situations when there is not much time to figure the correct manual settings. Unfortunately, when we have interesting or unusual lighting conditions, the automatic exposure system can be fooled and thus produce under- or over-exposed images. In such cases, you need to take control and override the automatic exposure system at the time of taking the image. In the above cases, the automatic exposure system will produce too dark an image and you need to override the automatic setting by adding exposure. If such scenes are photographed using automatic exposure, they will appear too light resulting in an overexposed image. In such situations you need to override the automatic setting by decreasing exposure. If such scenes are photographed using automatic exposure, they will result in underexposure and too-dark main subject. In such situations you need to override the automatic setting by adding exposure. If such scenes are photographed using automatic exposure, they will result in an overexposed image and too-light main subject. In such situations you need to override the automatic setting by decreasing exposure. When photographing such scenes, you need to decide whether the highlight or shadow area is most important, then set the exposure so that area is shown accurately in the final image. There are different ways to deal with high contrast situations - you can lighten shadows by adding fill flash or you can move closer so that the most important area fills the viewfinder frame then use exposure lock to lock the exposure from that position. You will also encounter other situations where it will be difficult or sometimes impossible to meter the scene such as moonlit scenes or scenes with fireworks etc. 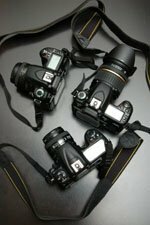 Your best bet in such cases is to experiment and use the exposure compensation to take other exposures both lighter and darker than the suggested automatic settings. To brighten an image, point the camera at an object that is darker than your subject and press the shutter halfway down to set the exposure. Keep holding the shutter button halfway down and then reframe your subject. This will result in the camera using the exposure setting that it found appropriate for the darker scene, resulting in brighter exposure. To produce a darker image, use the opposite approach. Important: If you are working in autofocus mode, hte focus is also set when you press the shutter button halfway down. So be sure that the object you use when setting the exposure is the same distance from the camera as your subject or the focus will be off. To get a practical experience with the creative camera controls follow our Photo Assignment to create a special effect from the way your camera perceives light. When using a film camera, you account for changing colour temperatures by using films with different light sensitivity and employing colour filters. Majority of the digital cameras, on the other hand offer automatic white balancing allowing the photographer to concentrate on other issues. In addition, when you are working with multiple light sources that have different colour temperatures, you may need to take control of white balancing. Perspective is an important way to gain a sense of depth and distance in a two-dimensional photograph. If you photograph a scene such as a landscape and try to get everything in by either zooming to wide or changing to a wide-angle lens, the distance elements will appear smaller and closer together as well as much further away, while subjects close to the lens will look large in proportion to the surroundings. Parallel lines in the image seem to converge towards the background. Due to this close viewpoint, the distances and scale are exaggerated resulting in an image with a steep perspective. If you move much further back or use telephoto lens, there will be much less scale differences between the foreground and background elements, and the perspective will be flattened and the image will have a cramped-up feel.